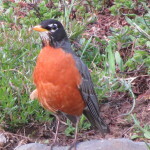 The American Robin is just as much at home here in the forest as he is in your own yard. Stop for a picnic lunch at one of the tables in the main field and watch one of the many robins plucking worms from the lawn. Listen for their friendly call: cheerily, cheer up, cheer up, cheerily, cheer up.